A cancerous conundrum: When will chemotherapy work? 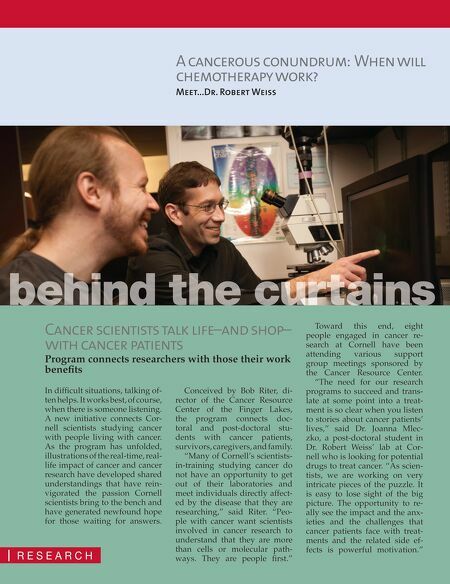 Meet...Dr. Robert Weiss behind the curtains Cancer scientists talk life–and shop– with cancer patients Program connects researchers with those their work benefits In difficult situations, talking often helps. It works best, of course, when there is someone listening. A new initiative connects Cornell scientists studying cancer with people living with cancer. As the program has unfolded, illustrations of the real-time, reallife impact of cancer and cancer research have developed shared understandings that have reinvigorated the passion Cornell scientists bring to the bench and have generated newfound hope for those waiting for answers. 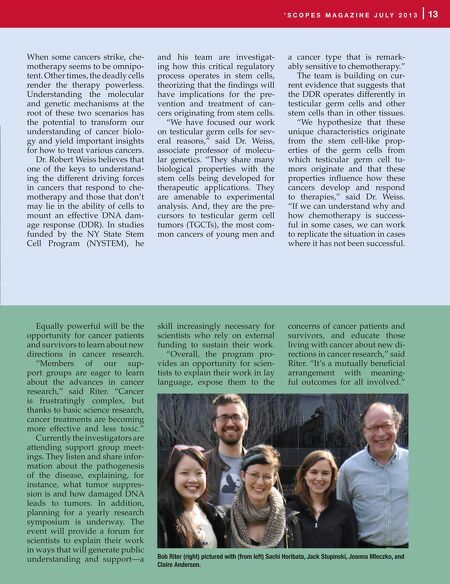 | RESEARCH Conceived by Bob Riter, director of the Cancer Resource Center of the Finger Lakes, the program connects doctoral and post-doctoral students with cancer patients, survivors, caregivers, and family. "Many of Cornell's scientistsin-training studying cancer do not have an opportunity to get out of their laboratories and meet individuals directly affected by the disease that they are researching," said Riter. "People with cancer want scientists involved in cancer research to understand that they are more than cells or molecular pathways. They are people first." Toward this end, eight people engaged in cancer research at Cornell have been attending various support group meetings sponsored by the Cancer Resource Center. "The need for our research programs to succeed and translate at some point into a treatment is so clear when you listen to stories about cancer patients' lives," said Dr. Joanna Mleczko, a post-doctoral student in Dr. Robert Weiss' lab at Cornell who is looking for potential drugs to treat cancer. "As scientists, we are working on very intricate pieces of the puzzle. It is easy to lose sight of the big picture. The opportunity to really see the impact and the anxieties and the challenges that cancer patients face with treatments and the related side effects is powerful motivation."